Happy Monday! In spite of this dreary, drizzly and cold weather, I have a little pep in my step, thanks to a restful weekend that included one of my favorite activities: searching for treasure at a local consignment shop! 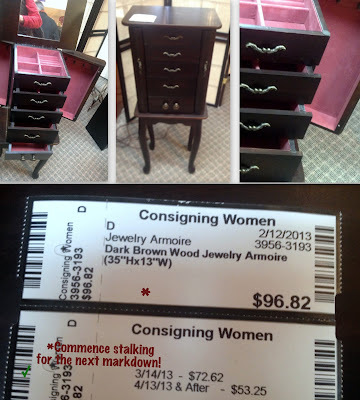 John's grandmother introduced me to Consigning Women just after our wedding. We were in dire need of furniture, but on a tight budget. Mimi took us to this little gem, and I immediately fell in love. 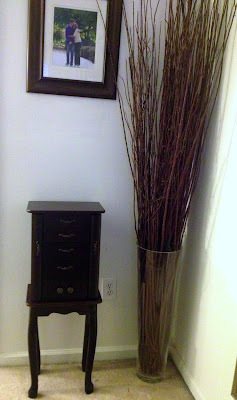 The store has beautiful and gently used furniture, decor items, artwork and even jewelry and bags. We were able to get our dining room table here for a steal - $360 for the table, including a leaf extender and six chairs (as seen here and here)! Ever since we snagged the table I've made a point of frequenting the shop once every couple weeks. 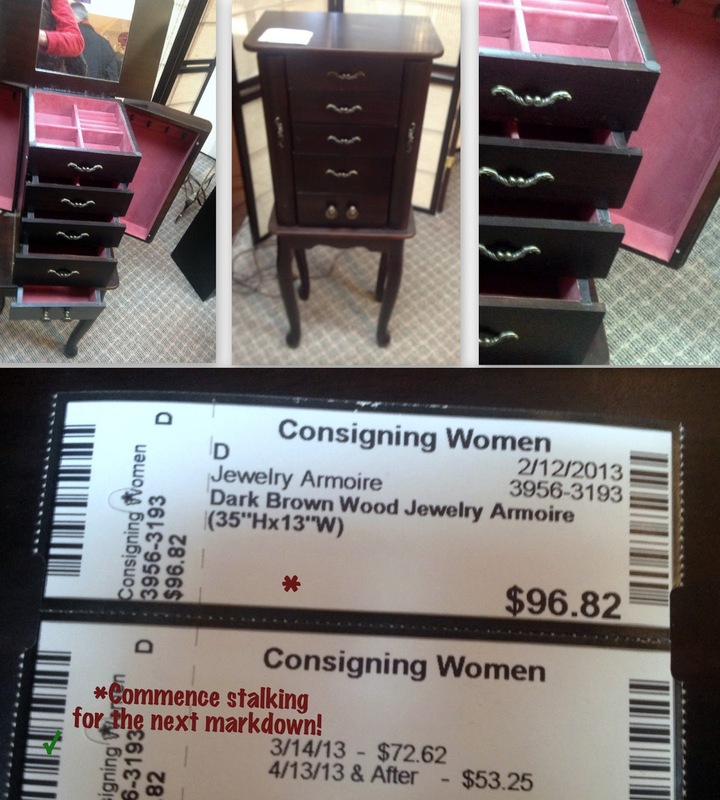 A couple weeks ago I saw a beautiful jewelry armoire. I adored it immediately, as I'd been looking for a jewelry box for some time. I saw the original price, and decided I would stalk it, hoping it would still be around once the price went down. When a piece comes in, it has a set price. However, there are two additional prices on each piece. After one month the cost goes down, and after two months it goes down even further. It can be a gamble to walk away from a piece, as someone might snag it before the price drops. I knew when the armoire was set to go down, and I planned a Saturday visit, hoping it would be there...Fortunately for me, it was! I texted John, and he enthusiastically told me to get it, knowing how much I loved it and was checking on it - what a sweet hubby! I knew exactly where it would go - in our master bedroom, and we both agreed that it would be perfect in a little girl's room one day (if we are blessed with one, that is!). Sides open to hang necklaces. 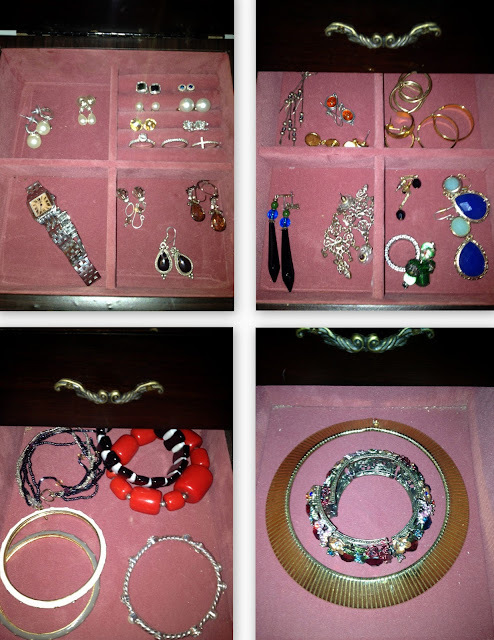 Fifth drawer (not shown) was perfect for storing all those extra buttons that come with shirts, dresses, etc.! I have so much fun with this kind of thing and would love to hear about it!